Last month I was contacted by Ian Marshall, the grandson of Private George Duff (#2227) and the great-nephew of Private Robert Duff (#2776). 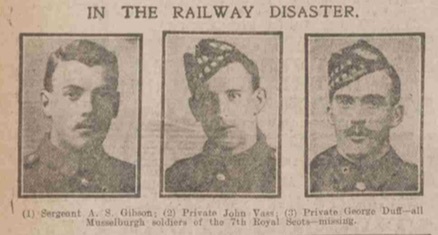 The Duff brothers enlisted with the 7th Battalion Royal Scots and were killed in the Gretna train crash on May 22, 1915. Ian has kindly allowed me to share a family photograph of his grandfather George with you. George Campbell Duff was born on March 13, 1887 in Newburgh, Fife. One of eight children, George was a coal miner like his father John and his younger brother Robert. On Dec. 30, 1910 George married Helen Steedman and moved in with his in-laws at 49 Inveresk Road in Musselburgh. Although the minimum height requirements at that time were 5′ 3″, George at just 5′ 2″ joined the 7th Battalion Royal Scots on Nov. 5, 1914. Robert Robertson Duff was born on July 28th, 1889 in Newburgh, Fife and married Jesse Edmonds Nisbet on Oct. 18, 1912. 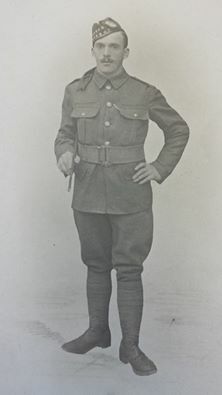 He enlisted with the 7th Royal Scots on Jan. 5, 1915. 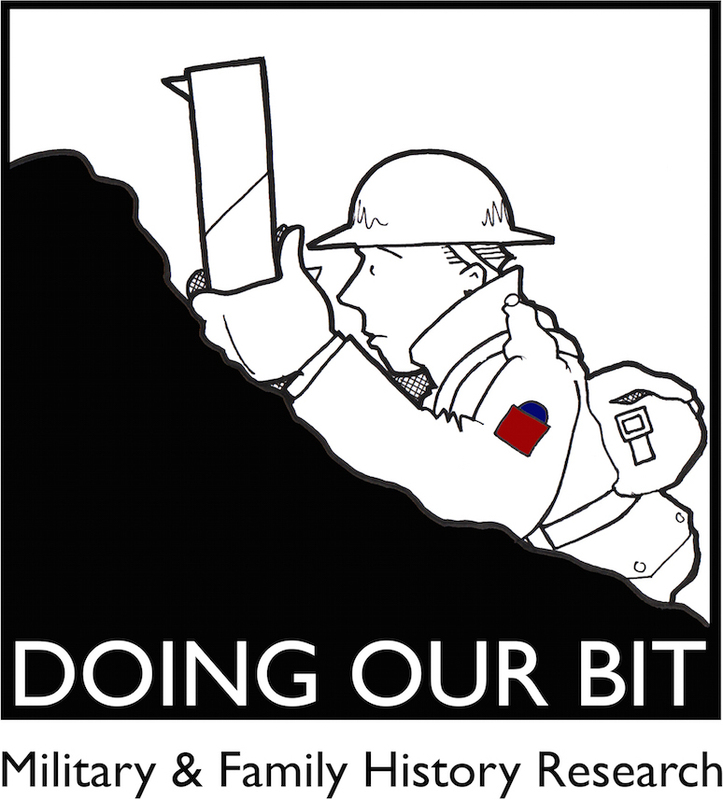 The Duff brothers were two of 214 soldiers who died at Gretna almost a century ago. Each soldier left a wife and two children in Musselburgh. Both widows were awarded a weekly pension of 18s 6d in January 1916 and additional one time payments as recorded in the Soldiers’ Effects Register. To add insult to injury, after the war George’s widow Helen received a £3 War Gratuity payment but Robert’s widow Jesse did not. George had just over 6 months and two weeks of service but younger brother Robert’s claim was, as recorded in the Soldiers’ Effects Register, “Not Admissible Under 6 Months Service“. It’s nice to meet Pte George Duff’s namesake and I’m glad you enjoyed the post. Thanks for taking the time to comment. Thank you so much. This means a lot to me. You’re very welcome Ian. Thanks for letting me post your grandfather’s photo on my blog. 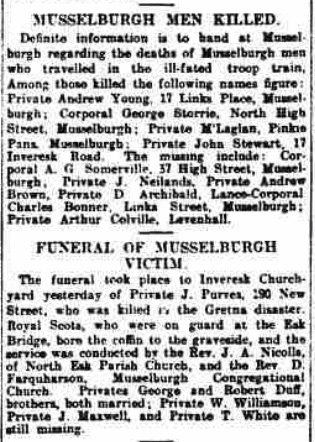 Corporal George Storrie (Storie) (newspaper article) was my Great Uncle. Thanks for your comment. There are several other familiar names in that article too, including David Archibald, John Neilands and of course Arthur Colville whose postcards led to all this research. I am a Great Nephew of the two soldiers mentioned. I wonder if Ian Marshall might have knowlege of another brother of the two soldiers, John Duff, who was my Grandfather. Oops !! I asked if Ian Marshall might have any knowlege of a brother of the two mentioned above called John Duff. The name I should have written is James Duff who was indeed my Grandfather. Glenn, are you speaking of James Duff 1874? married to Annie Campbell? If so, he is my great great grandfather. George and Robert are my mothers 2nd great Uncles.